The constellation Canis Major dominates the southern sky at this time of year, containing many bright and interesting objects. Look southward just after the sky gets dark at this time of year, and you will be sure to see Sirius shining brightly. This is the brightest star in the sky, and marks the eye of the constellation called Canis Major, Latin for "the Large Dog." Just to the east (left) of the triangle at the bottom of Canis Major is the 8th-magnitude star VY Canis Majoris. Although not very bright, this is one the largest stars in the sky. It is 1,400 times wider than the sun, but its mass is less than 20 times that of our star. VY Canis Majoris is a very cool red star, with a surface temperature of about 5,820 degrees Fahrenheit (3,216 degrees Celsius) — more than 4,000 degrees F cooler than the sun. Canis Major, and its neighbor Puppis to the east, contain many interesting open clusters, as this is one of the richest parts of the Milky Way. My spell check keeps changing "Puppis" into "Puppies," which seems appropriate near a large dog, but in fact "Puppis" refers to the poop deck of the ship Argo Navis. This was once a large constellation, later broken up into a number of smaller constellations representing the components of the ship: Puppis (the Poop Deck), Vela (the Sail), Pyxis (the Compass), and Carina (the Keel). 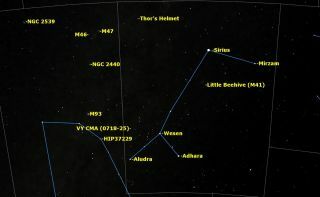 The brightest star cluster in Canis Major is number 41 in Messier’s catalog, sometimes called the Little Beehive Cluster. This cluster is a fine sight in binoculars or a small telescope. Across the border in the constellation Puppis, there are three more clusters from Messier’s catalog, numbers 46, 47, and 93. All of them are worth a look. There are also many interesting nebulae in Canis Major and Puppis. The most famous of these is NGC 2359, also known as "Thor’s Helmet" or the more prosaic "Duck Nebula." This nebula is best observed with at least an 8-inch (20 centimeters) telescope; a nebula filter is very helpful in bringing out its shape. Look also for NGC 2440, a small, bright planetary nebula, most easily seen with a nebula filter. As you can see, there is a lot more to Canis Major than Sirius.